Submitted Photo Mark Lehner describes the excavations as he takes a group of visitors (not shown in photo) on a tour of AERA’s 2018 work at Giza. The cities of Giza and Cairo sprawl in the background. Photos from AERA. 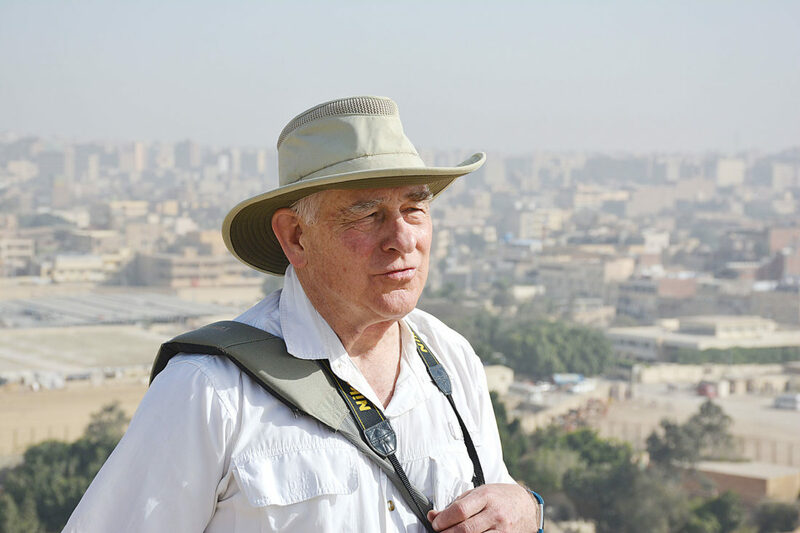 World-renowned Egyptologist Mark Lehner’s journey to the Giza Plateau started in North Dakota. Lehner said his journey to Egypt began more than 40 years ago when in September 1971 he dropped out of college (He’s Dr. Mark Lehner now.) and didn’t know what to do next. He decided he would hitchhike across the country. So he packed a few things and set out from Minot on U.S. Highway 83. He said he thought he would meet people he had never met before. “I’m going to meet exotic people. I’m going to meet people with strange new ideas and experiences… I’m going on an adventure,” he said. Lehner, director and president of Ancient Egypt Research Associated Inc., a nonprofit organization he co-founded and based in Boston, visited Minot this month for his 50th reunion of his Minot High School class of 1968. 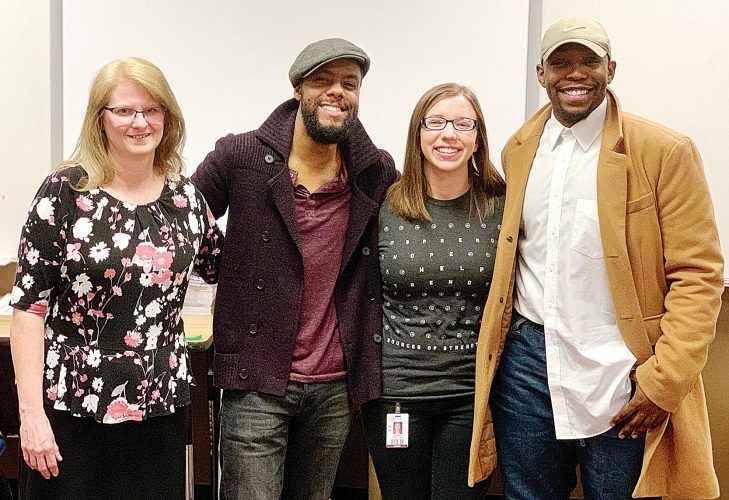 He gave a presentation about his experiences for the class reunion’s kick-off event at the Mouse River Players Theatre in Minot on Aug. 2, with about 210 people attending, many of them his high school classmates. Lehner gave a second presentation on Monday at a joint meeting of Minot Rotary Club, Minot Lions club and Minot Sertoma Club in the Grand Hotel. Submitted Photo Mark Lehner, center, discusses the 2018 excavations at the Kromer Dump site with Mohsen Kamel, left, field director, and archaeologist Aude Gr—zer Ohara, who points to artifacts they discovered. The finds from the excavations are placed in the plastic boxes, which go the AERA Field Lab for further study. 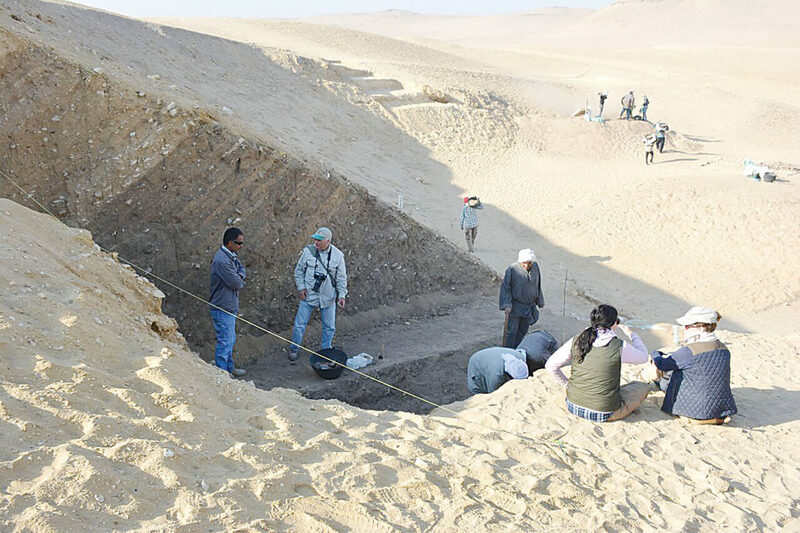 The Kromer Dump is just west of the Lost City of the Pyramids on the Giza Plateau. Lehner traveled across the country in 1971 until arriving at Virginia Beach, Va., headquarters of the Edgar Cayce Foundation’s Association for Research and Enlightenment. He was familiar with the organization and it made it possible for him to make his first trip to Egypt with an Edgar Cayce Youth Tour in 1972. “I was extremely interested in this legend of the Hall of Records and the fact that the Edgar Cayce Readings said there was a passage from the right paw of the Sphinx into this Hall of Records,” Lehner said. Cayce, an American clairvoyant who died in 1945, believed the Hall of Records was under the Great Sphinx. Not long after that he attended the American University in Cairo, a private liberal arts American-run school, from 1973 to 1975 where he earned his B.A. degree in anthropology. He said he felt there was so much that Egyptology, archaeology and academia didn’t know. By this time he started to participate in archaeological missions as a surveyor and a mapper. Submitted Photo Mohsen Kamel, left, field director, and Mark Lehner discuss the large trench that the team excavated into the massive 4th Dynasty dump at the Kromer Dump site. Lehner went to the American Research Center in Egypt where he knew the director and assistant director. “I said nobody’s ever adequately mapped the Great Sphinx, which was true,” Lehner said. “I said I can do a project where we thoroughly map the Sphinx.” The Cayce group helped finance the project. “The Sphinx actually became a key for understanding the wider Giza Plateau,” Lehner said. He said the Sphinx is carved out of natural rock, like Mount Rushmore in South Dakota. Lehner mapped and excavated the Great Sphinx and Pyramids of Giza. The work has expanded to the Giza Mapping Project, including finding the Lost City of the pyramid builders. Lehner continued his education, receiving a doctorate degree in Egyptology at Yale University in 1991. “I started realizing by what I learned that to really understand the pyramids I had to turn my back to them,” he said. “That was where the people are.” He questioned where are the people, where is the settlement, where is the infrastructure, etc. Submitted Photo Mark Lehner examines artifacts recovered from the Kromer Dump site excavations, as archaeologist Vir’g Pabeschitz discusses their significance with Lehner and Mohsen Kamel, field director. Photo from AERA. In the early 1990s, Lehner was hired as assistant professor at the University of Chicago’s Oriental Institute, one of the most prestigious archaeological centers in North America. He left there a few years later to return to the field. “The Lost City of the Pyramids was calling,” he said. His friend, Egyptologist Dr. Zahi Hawass asked him to return. Lehner and Hawass excavated and discovered the Lost City of the Pyramids – where the 20,000 people lived when they built the pyramids. The Lost City is a settlement bigger than several football fields. The findings include a huge gallery complex or series of blocks of galleries. They figure the galleries were barracks for the workforce and each gallery could hold about 40 people. “This is the footprint of the people who built the pyramids,” Lehner said. Ruins of a port have been unearthed at the Giza pyramids and they are studying how the Nile River flooded and how it was used as a hydraulic lift. He said the entire area would flood for part of the year each year. The Egyptians could guide boats loaded with tons of stone for construction. Eloise Ogden/MDN Egyptologist Mark Lehner, who grew up in Minot, is shown at the Mouse River Theatre in Minot before giving a presentation about his journey to the Giza Plateau and the work he is doing there. Lehner is director and president of the Ancient Egypt Research Associates Inc., based in Boston. “Since 2005 we’ve been teaching this kind of archaeology in field schools where we are not looking for things, we are looking for information and that takes a team effort,” Lehner said. The archaeological field schools conducted by AERA train young Egyptian archaeologists working for the Egyptian Ministry of Antiquities on behalf of the American Research Center in Egypt. As a result of his extensive work at the Giza Plateau, Lehner is acclaimed as knowing more about the Giza Plateau than anyone else alive. His work has been the subject of numerous documentaries and authored numerous publications and books. 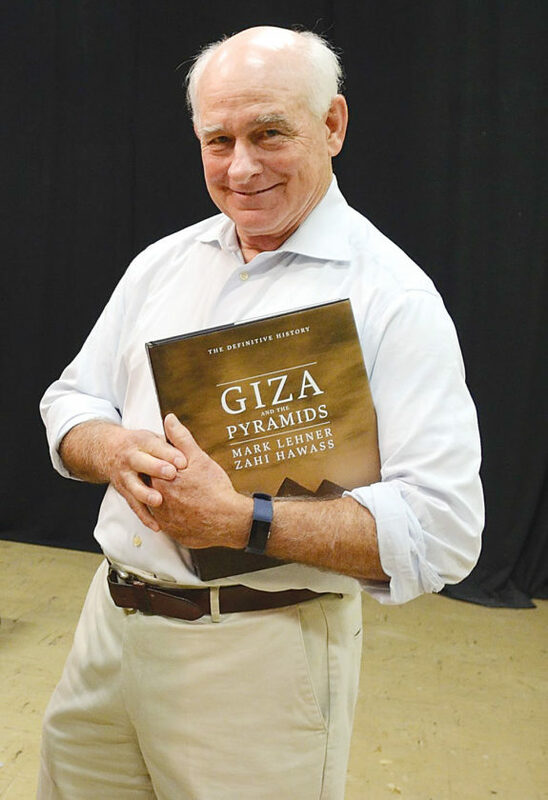 His most recent book, “Giza and the Pyramids,” was written along with Zahi Hawass. “But it’s only scratching the surface about what I know about the Giza Plateau and this archaeological Hall of Records that we have established,” he said. “There’s so much left to do,” Lehner went on. Lehner, who is 68, said time is of the essence and he just wants to keep going on what he started years ago. Submitted Photo Still image from the video “Dust,” by Maria Agureeva is featured at the Northwest Arts Center’s Walter Piehl Gallery at MSU. Submitted Photo “American Friday,” a metal sculpture by Benjamin Jackson is featured at the Northwest Arts Center’s Walter Piehl Gallery at MSU. Submitted Photo A handmade guitar by Beau Theige is featured at the Northwest Arts Center’s Walter Piehl Gallery at MSU. Submitted Photo Members of the Minot High School Class of 1953 held their 65th reunion in Minot Aug. 1-2. At that time, the high school was located in downtown Minot in the present-day MHS-Central Campus building.